Consumer expectations for online shopping has never been higher. Shoppers who browse and purchase online have come to expect endless aisles of products to browse, intuitive search and filtering, personalized suggestions, easy and secure check-out, free shipping and fast delivery. This raised table stakes are due in large part to ongoing optimization from Amazon. Product pages have influence in store as well. Web and mobile screens are influencing $2.6 trillion of US sales according to Deloitte. It's critical to get your product page right, to win sales online and in-store. We found that 87% of consumers rate product content extremely or very important when deciding what to buy. We asked 1,000 shoppers what they wanted to see from a product page in our recent study: Cracking the Consumer Code: Your Future with Shoppers Relies on Your Digital Product Content. Shoppers need reliable, clear and compelling product content to give them the confidence to buy. Here are 5 new rules to get you started, directly from the consumers. Rule 1: Include at least 3 photos. 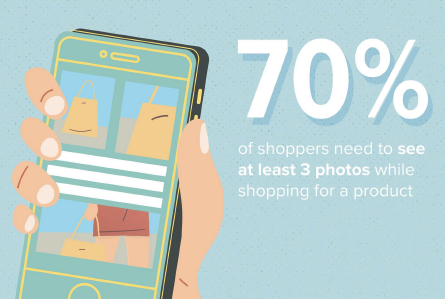 70% of shoppers said they want 3 or more images of the product they are going to buy. Audit your product content to ensure you have high-resolution of your product from every angle that helps shoppers see what they are buying. Rule 2: Get detailed in your product description. From clothing to online grocery consumers want detailed product description before buying. Be sure that your product description includes specific details about the product and its benefits. Rule 3: Prioritize mobile. The vast majority of consumers under 60 shop using mobile. Most frequently, while in a store shoppers are checking product price and reviews on their phones. Be sure that your mobile site has information consistent with your in-store displays. Rule 4: Include at least 3 reviews. 86% of shoppers agree that they prefer to read at least 3 reviews before buying a product. 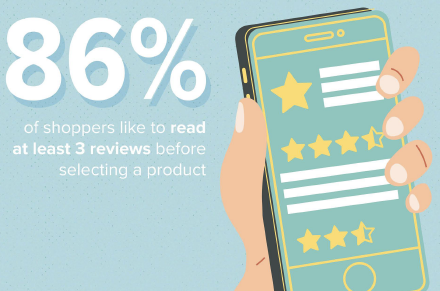 Harness the power of your product reviews by making it easy for shoppers to contribute reviews and scanning them for valuable product insights. Rule 5: Update keywords based on relevance. 38% of shoppers start shopping on Google and the buy from somewhere else. To make the most of this opportunity you must include keywords that will help your products rise in relevance on the search engine. The easier it is for shoppers to find your product, the more likely they are to buy it. The bottom line? You must invest in your product content and establish a way to refresh it regularly. Learn how your content is performing on Amazon today through our free Amazon product content grader.